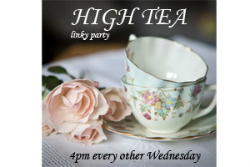 Welcome to the second High Tea linky party! Hang your coats up over there and pull a chair up at the table. Are you sitting comfortably? Then let’s begin! If you fancy joining me for High Tea, then you’ll need to make sure you’re linking a post that has a foodie theme. Now, this could be a teatime recipe, your amazing collection of vintage teacups, a painting, a post about your kids making a mess at teatime, a crafty project, photographs, even fashion. Let’s see how creative you can be with this theme. – Please have lots of fun and do come again! Reblogged this on Black Cat Originals.